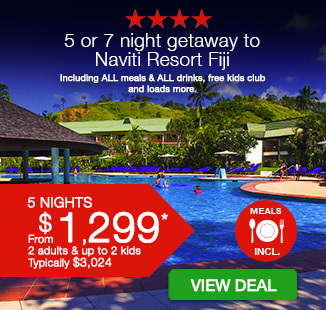 5 or 7 night getaway to Naviti Resort Fiji with ALL meals & ALL drinks, free kids club and loads more. 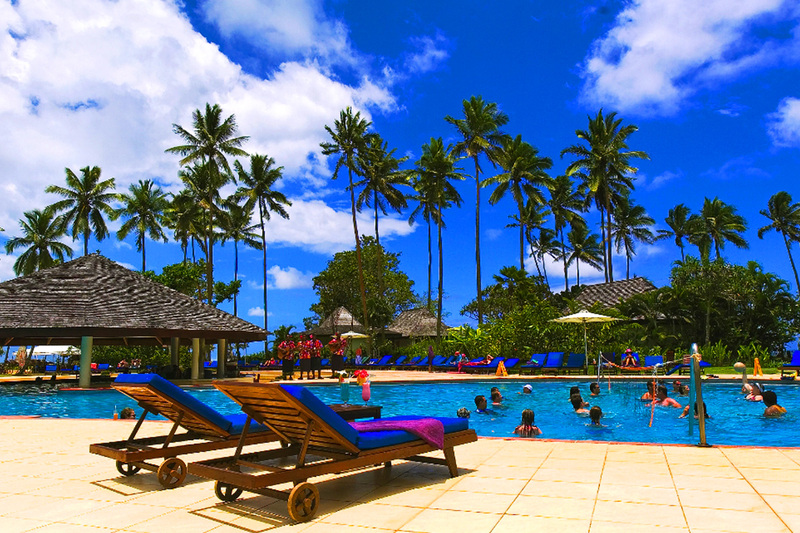 5 or 7 night getaway to Naviti Resort Fiji with ALL meals & ALL drinks, free kids club and loads more. LIMITED TIME OFFER! 2 adults & up to 2 kids |	Typically $3,024! This beachside deluxe resort on Fiji’s Coral Coast delights and was awarded the 2015 Travellers’ Choice Family winner and 2015 Certificate of Excellence awards from Tripadvisor. The resort boasts a large swimming pool with a children’s area plus a swim-up pool bar, on-site 9 hole golf course, tennis courts, gym facilities, Joy day spa, 4 restaurants including a cocktail bar perfect for sunset drinks and a kids’ club for children aged 5 – 12 years. 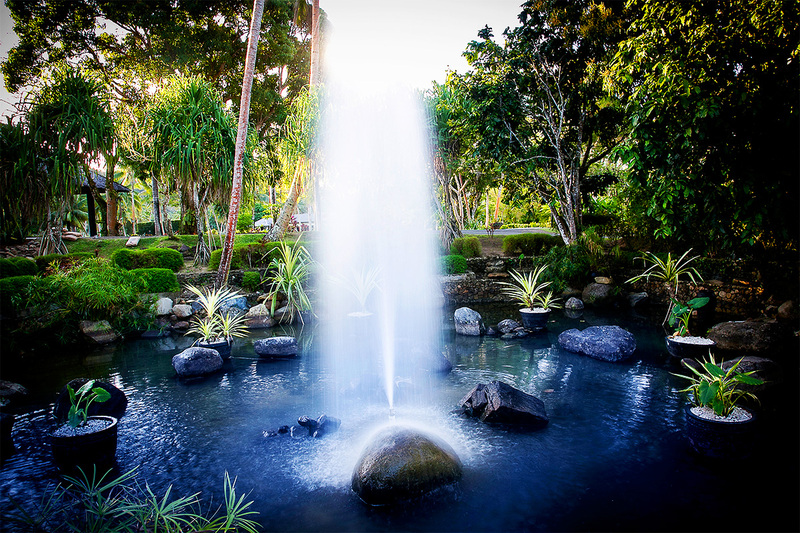 5 or 7 nights accommodation in a Garden View Room for 2 adults or 2 adults and up to 2 children 12 years of age and under, featuring a furnished balcony or patio overlooking tropical landscaped gardens. DAILY Full Buffet Breakfast for all guests. DAILY Lunch and DAILY Dinner for all guests – buffet, a la carte or set menus for lunch and dinner (special kids menu also available). Kids menu for children available at selected restaurants. DAILY UNLIMITED DRINKS including local spirits, draught beer, house wine, sparkling wine, soft drinks by the glass and fruit punch. See Fine Print for more information. Free ice cream for children from 11am – 7:30pm daily (does not include New Zealand Natural ice cream). Unlimited complimentary golf green fees. Excludes clubs, balls and use of motorised buggies. Additional charge applies & subject to availability. 1 x Complimentary Bay Cruise (including wine and savouries) per stay. Children 12 years and under travel with parents at no cost – subject to weather and tidal conditions. 1 x Complimentary Coral Viewing Cruise per stay. Children 12 years and under travel with parents at no cost – subject to weather and tidal conditions. 1 x Guided Snorkelling Trip per stay. 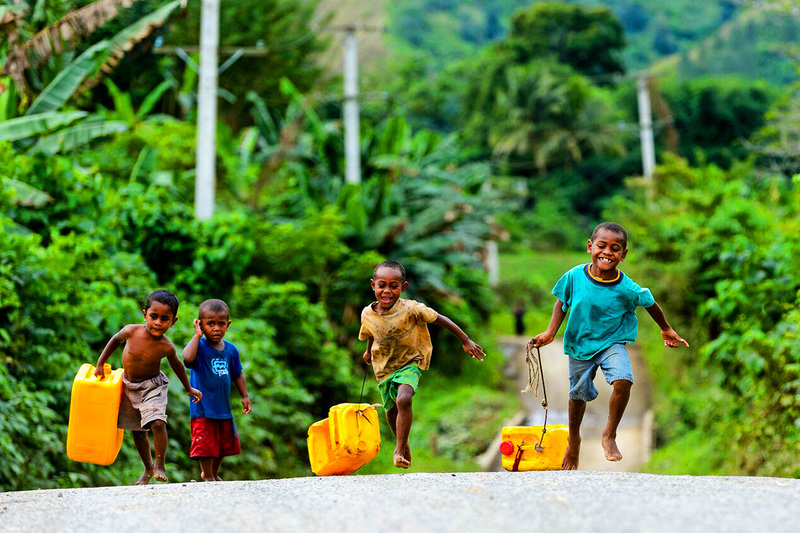 Children 12 years and under travel with parents at no cost. Subject to weather and tidal conditions. 1 x Complimentary introductory Scuba Diving lesson. Per person per stay in the resort pool— for adults only. Complimentary non-motorised water activities including non-guided snorkelling, kayaking, stand up paddle boards, tennis, archery, weaving demonstration, night entertainment (excludes firewalking). Free Kids Club for children ages 5 – 12 years per stay. Open daily 10am – 10pm. Closed during meal times. Welcome drink and cool minted towel on arrival. One hour Free Wi-Fi per day. 5 night packages from $1,299 for 2 adults and 2 children – Value $3,024. 7 night packages from $1,789 for 2 adults and 2 children – Value $4,233. Need more space? UPGRADE to a Garden View Room with a SECOND KIDS ROOM and receive ALL of the above for 2 adults & up to 3 children 12 years & under! 5 nights ALL INCLUSIVE in a Garden View Room with a 2nd Kids rooms from $2,199 for 2 adults and up to 3 children 12 years of age and under. Value $8,127. 7 nights ALL INCLUSIVE in a Garden View Room with a 2nd Kids rooms from $2,999 for 2 adults and up to 3 children 12 years of age and under. Value $11,266. 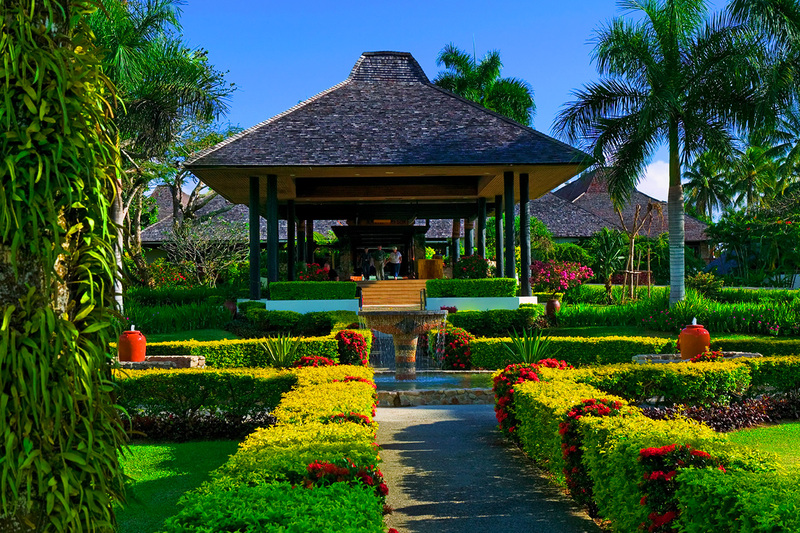 Garden View Rooms: feature a furnished balcony or patio overlooking tropical landscaped gardens. Garden View Room: 2 adults or 2 adults & up to 2 children 12 years & under or 3 adults. Garden View Room with Second Kids Room: 2 adults & up to 3 children 12 years & under. Bedding Configuration: 2 x double beds or 1 x queen bed and 1 x single bed. Extra Person Charge: approx FJD$220 (approx AUD$150) per person per night All Inclusive. Payable direct to The Naviti Resort upon check-in. Beverages are limited to one (1) drink per person per order by the glass only. All beverages must be consumed in an operational outlet only. The ordering of drinks for other guests who are not on the All Inclusive Package will be charged to your account. The all-inclusive beverage package does not include the following beverages: mini bar, bottled beers, bottled water, milkshakes, speciality coffee, slushies and room service. Buffet breakfast, buffet or a la carte lunch and dinner at selected restaurants. Children’s menu available at selected restaurants. Kids Eat Free policy entitles Children to Buffet Breakfast (7.00am-10.30am), Buffet & A’la carte lunch(12.00pm-2.30pm) & Children’s Buffet Dinner at the appointment dinner time(5.30pm-6.30pm) daily. Should children wish to dine in the Bamboo Terrace with parents in the evening, a 25% discount will be offered off the child’s meal. Free ice-cream from 11am – 7:30pm daily does not include New Zealand Natural ice cream. Golf: excludes clubs, balls and use of motorised buggies. Additional charge applies & are subject to availability.